« R. Lalique Silver Rhinoceros Beetles Chalice Sells for $235,000! 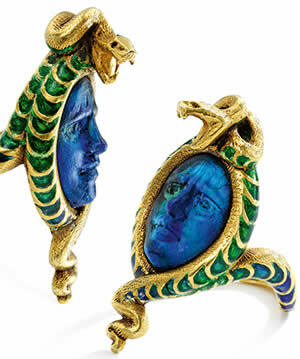 R. Lalique Medusa And Serpent Ring Makes A World Record $322,000! The whole Medusa And Serpent thing is a bit of a misnomer. In Greek mythology, Medusa was a winged Gorgon (one of three sisters) that had snakes for hair. People who looked at her turned to stone. It really should just be Medusa Ring and you can infer the whole serpent thing. Of course the hero Perseus beheaded Medusa and even then her head was known to continue to turn those who looked at it to stone. Apparently the wings weren’t part of the stone effect*. Even though the Greeks gave it a whole new name, I’ll bet a few of you readers know exactly what this whole Gorgon thing is all about. In modern times many people just call it “mother-in-law”. OK, getting to our story, some incredible R. Lalique Jewelry has appeared with the Medusa theme, including the great Elizabeth Taylor Burton Pendant in 2014 that made over $550,000 at auction in New York. That pendant had a couple of snakes and a drop pearl around a dark masque. 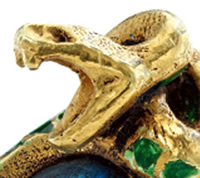 The ring has but one snake with enameled scales that extend to the shank, and which shows a bit more dramatically surrounding a dark blue-green glass masque. 18 carat gold, enamel and glass! 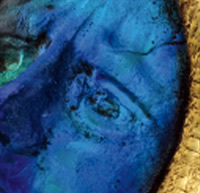 When the Sotheby’s jewelry expert wrote us here at World Headquarters about the listing of the ring on the website, the only comment was “This is one of the most exceptional rings I have ever seen by Lalique”. Apparently at least two bidders agreed! When the hammer came down on September 22nd in New York at their “Important Jewels” sale, against an estimate of $15,000 – $20,000, the ring without “Jewels”, “Important” or otherwise, made $322,000 including the buyer’s premium. That made it the 5th highest selling lot for the day, and obviously the only “Jewel” without one. 4. Three items containing a total of (get ready) 264.9 carats of yellow sapphires including one that weighed almost 85 carats alone, 33 carats of blue sapphires, and 49 carats of diamonds! Rene Lalique of course was not selling jewels. He was creating art. Over 70 years after his death, out of over 200 “Important” auction lots on a pleasant afternoon in New York, the art did pretty good. Émile Gallé would be smiling**. 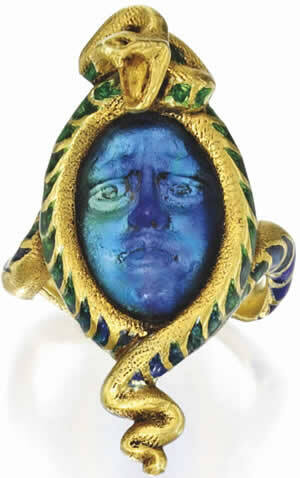 It’s a new world record price for an R. Lalique Ring at auction. And not a bad day for the great Rene Lalique. * The Medusa stone effect should not be confused with the modern day stoner effect, where stoners sometimes try to fly off bridges without wings to no good effect! This entry was posted on Saturday, October 1st, 2016 at 1:22 pm	and is filed under R Lalique and Rene Lalique Auction News and Results, R Lalique Ramblings, R Lalique, Rene Lalique, and RLalique News.